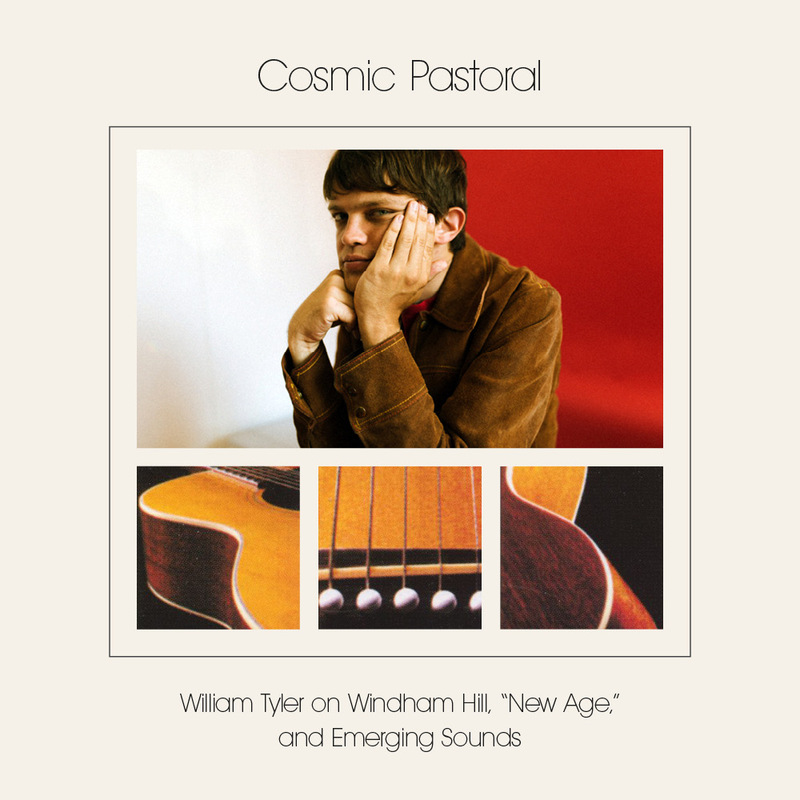 On Friday, January 25, William Tyler releases his fourth solo album, Goes West. A stunning and artfully constructed set of songs, it finds the Los Angeles-via-Nashville composer on acoustic guitar, joined by a cast of sympathetic collaborators, including Meg Duffy and Bill Frisell on electric guitar, bassist (and producer) Brad Cook, James Wallace on keys, and Griffin Goldsmith on drums. Together, this band brings to life some of Tyler’s most open and sweet compositions. There are a lot of traditions at work in Tyler’s songs—guitar soli, folk blues, new age, country, avant-garde, cosmic American music—but what emerges on Goes West isn’t limited to any of single genre tag; instead, Tyler uses elements of each to create his own sonic world. Above all, it’s a welcoming one. Here, Tyler explains where he’s coming from, examining the connections between the Palo Alto-born Windham Hill Records, the new age movement, and the sonic perfection of ECM. There’s a particularly affecting moment for me in the 1986 Windham Hill in Concert film, a strange hybrid of studio performance and audience shots, meant to transport the viewer to the cosmic amphitheater of Red Rocks, Colorado. Label founder William Ackerman is performing his delicate solo guitar composition “The Bricklayer’s Beautiful Daughter,” bathed in stage light and with a zen-like focus. It’s everything I want from a guitar piece—a timeless folk melody with just the right amount of chordal and harmonic movement to make it seem more like a piece of chamber music. And Ackerman is up there, seemingly in front of thousands of people under Western skies and stars, reaching out with nothing but his acoustic guitar. The fact that much of the video for In Concert, which also features particularly remarkable performances from Michael Hedges, was shot on a soundstage and not in fact “in concert,” is a testament to Ackerman and company’s desire for sonic clarity and perfection. A certain amount of control even when making a “live” record. But the fact is, concerts like these did in fact take place, and not just at Red Rocks, but all over the United States and beyond. For a moment in the 1980s, Windham Hill artists like Ackerman, Hedges, Alex De Grassi, and George Winston ruled a segment of the marketplace, making beautiful, exploratory music with equal debts owed to the modernist folk of John Fahey and the old classicism of Debussy. The music was expansive and pastoral, and the photographs of unspoiled nature that served as album art acted as perfect visual partners. It was, in some ways, the zenith of the “new age,” genre, though the label would become, for many, a controversial and unwanted term. There has been in the last decade a true revivalism and reappraisal of new age music amongst a new generation of younger listeners, although what linked the meditative and expansive electronics of, say, Iasos or Steven Halpern to the rather unadorned acoustics of Ackerman and George Winston, was, I’d argue, less a sonic affiliation and more a connection born out of the need to market this music. Windham Hill helped popularize the term “new age,” taking it from its countercultural context to the mainstream. New age would come to mean almost any sounds that could count as meditative or even just “quiet.” Soon, there was a “new age” section at Tower Records and in 1987, a catch-all Grammy category. But while there is a clear continuum from psychedelic music and minimalist avant-garde modernism into a certain strain of what is now thought of as ‘OG new age’ —Halpern, Laaraji, Vangelis, or Constance Demby—the pristine and placid universe that Ackerman and co. carved out with Windham Hill still stands curiously on its own. It deserves its own reappraisal, but also perhaps deserves a recategorization. They were able to carve out a very particular space, creating music that wasn’t traditionally commercial, yet proved extremely popular. It was a heady time. In the ’70s and ’80s, albums like Keith Jarrett’s Koln Concert, and Mike Oldfield’s Tubular Bells, and the soundtracks of Vangelis, though not linked by any specific aesthetic or geographic location, were commercial hits. These instrumental sounds were soothing and ambient, but they rewarded active listening, and the movement involved artists from various backgrounds. Of course, the term “new age” was never popular among many of those who perhaps unwittingly pioneered the genre. Composer Harold Budd, a colleague of Brian Eno, detested the term. Guitarist Michael Hedges preferred the descriptor “heavy mental,” and even Windham Hill label founder Ackerman has many times voiced his dismay at the umbrella-like nature of the term—the way it tidied up and united widely diverse artists—as it became a more and more effective marketing tool. What I hear in these artists is an unspoken aesthetic alliance. When Brian Eno began making ambient music, his purpose was two-fold. It was instrumental music that could necessitate active listening, but could also work the exact opposite way, as sonic wallpaper used for relaxation and contemplation and none the worse for it. Eno was at the forefront of a group of artists in the 1970s trying to unite the modernism of pop with the theoretical and compositional approaches of modern classical. It’s no wonder that when Eno himself started a record label of his own, Obscure, he championed a fresh mix of avant-garde classicism (Harold Budd, John Cage, Gavin Bryars) and instrumental chamber pop (the peerless Penguin Cafe Orchestra). While the label itself was short-lived, issuing ten releases from 1975 to 1978, its influence on Windham Hill is clear—note the uniform artwork, the wide range of exploratory music, and the value put on inter-label collaboration between artists. On the other side of the English Channel, a similar blend of aspirational aesthetics and sonic clarity was being championed by Manfred Eicher’s ECM Records. While a bulk of what ECM released in the 70s and early 80s was certainly progressive jazz, it’s always been easy for me to hear a sonic kinship between Jarrett’s Koln Concert recordings and the piano work of George Winston, whose Windham Hill-released Autumn was a mega-seller, or a direct connection between guitarist Pat Metheny’s New Chataqua, itself a solo guitar record, and the explorations of Michael Hedges and Alex De Grassi. What is key to me as a listener/student/consumer is less so the aspect of ECM being a platform for jazz or new classical per se, and more the way a sonic and visual aesthetic established a brand identity—a tactic Windham Hill would go on to owe a great debt to. When you bought an ECM album, you didn’t just perceive the fingerprints of Eicher—you knew the record would sound a certain way, look a certain way, bear a mark of high fidelity and visual clarity. It inspires the desire to possess all of the titles in the catalog, almost like baseball trading cards. So now we come back to the very particular kind of American optimism and rural pastoralism of Ackerman and Windham Hill. Like many, I came to the acoustic guitar as a compositional instrument through the prism of Fahey and Takoma records—Robbie Basho, Leo Kottke, Peter Lang. I always found it somewhat ironic that the term “American Primitive” seemed to be applied to a type of guitar music that, while perhaps not coming from a place of formal academic training, was anything other than “primitive.” But there is a certain grit to the Takoma catalog, an almost punk-folk aesthetic fueled by the gleeful iconoclasm of label founder Fahey. It’s seemingly a world away from the supposedly placid confines of the Windham Hill discography. And yet there were many interconnections between the two labels. George Winston recorded solo piano music for Takoma; Robbie Basho recorded several seminal albums for both labels. Ackerman’s first release and the inaugural Windham Hill record, The Search for the Turtle’s Navel, is a Takoma record in everything but actuality. Ackerman adopts not only Fahey’s playing style, but his proclivity for expansive song titles and even the recurring theme of the turtle/ tortoise. So while Fahey would fly the flag of restless outlaw and upsetter of norms until his death, and Ackerman would helm a record label that would sell not just millions of albums as a flagship brand of new age, both men were outsiders and entrepreneurs who believed in the limitless possibility of guitar driven music. Ackerman, like his labelmate and cousin Alex De Grassi, was/is a carpenter. For all the cosmic aspirational energy around the Windham Hill aesthetic, I sense a very American kind of craftsmanship, a debt to nature and to a world made by hand. In 1992, at the height of the label’s success, Ackerman sold his share and left California for Vermont. He was tired of being a mogul in California at the head of an unlikely empire. He wanted to be a carpenter again. There’s always seemed to me a distinct disconnect between the music these guys made and the amount of commercial success they encountered. As inviting and warm as the music Winston, Ackerman, De Grassi, Hedges, et all were producing, it was still largely instrumental, idiosyncratic, and above all, not “pop” music. As such, they alongside a host of other electronic, progressive, and meditative artists, represent a strange and wildly free moment in music where mainstream commercial success and the lack of traditional pop form didn’t negate each other. I feel like, if I at all am ever asked about my process and the purpose of my music, I most often am asked about my lack of lyrics, which is just what it means to be a non-classical instrumentalist in this new era of extreme uncertainty in the music business. I think rather than try to codify what I do, I pretend to be like Chauncey Gardener in Being There. I don’t think of myself as being a ‘new age’ artist any more than I think of myself as an ‘Americana’ artist and honestly, I’m not too concerned either way. I’m grateful to do any of this as a career. If I find any optimism in streaming culture, it’s that there might be new avenues for people to discover unorthodox music as the relevance of old platforms seems to have flown completely out the window. It’s a peculiar place to be right now; not wanting to embrace the certainty of a marketplace change while at the same time trying to survive in it and remain open to growth. I don’t think there’s necessarily a direct kinship between Windham Hill artists and certain contemporary colleagues of mine I’m also a fan of—among them Nils Frahm, Marisa Anderson, Mary Lattimore, and Julianna Barwick—but I do think all of us are trying to explore the limits of a zone where abstraction and melody can live without ever becoming “pop” music. In the meantime, I always encourage Fahey devotees to go back revisit the early work of Ackerman, Hedges, and De Grassi. Just because one group of artists sold millions of records and the other championed his own brand of joyful disruption, and at times toiled in obscurity, doesn’t mean that they weren’t and aren’t all united in a kind of strange outsider brotherhood. I like to think of all of this music being connected by something other than “new age” or even “heavy mental.” I think of it as “Cosmic Pastoral”, a global and ever-growing network of artists from different backgrounds, playing on different instruments, striving to paint portraits in sound without resorting to pop and rock tropes. We might not get to tour stadiums nowadays, but we owe a debt to those that showed the way.